Dance is one of the best art forms for expression. People gyrate in order to celebrate, commemorate or even to prepare for some ritual. One of the largest and most popular ethnic groups in Nigeria is the Igbo tribe. The Igbo people reside in southeastern and south-central Nigeria. When one speaks about the culture of a tribe, interest is in the art, food, music, language, and even the cultural dance forms. Historic and traditional dance goes back hundreds and thousands of years. Nigeria has varieties of folk and tribal dances in regions across the country. The eastern region, which consist mostly of the Igbo tribe, have a list of traditional dances performed as a form of emotional expression, social interaction, or exercise and these dances are sometimes used to express ideas or tell a story. Atilogwu is a traditionally spirited youth dance from the Igbo ethnic group of Nigeria. Atilogwu is one of the most entertaining Igbo dance that focuses on vigorous body movement and often includes acrobatics flips, high jumps and so on. Ogene dance (Egwu ogene) is a popular traditional energy dance from the northern part of Igbo land mainly in Enugu and Anambra. Although know as Egwu ogene(ogene dance). Ogene is not the only musical instument that produces the medody that the ogene dancers dance to, other instuments that gives ogene music its melodious tone includes. Ogene, Oja or Opi, Igba, Abia, Oyo or Ichaka, Udu and sometimes Ekwe. Ikpirikpi ogu dance is a popular war dance performed in several parts of Eastern Nigeria. 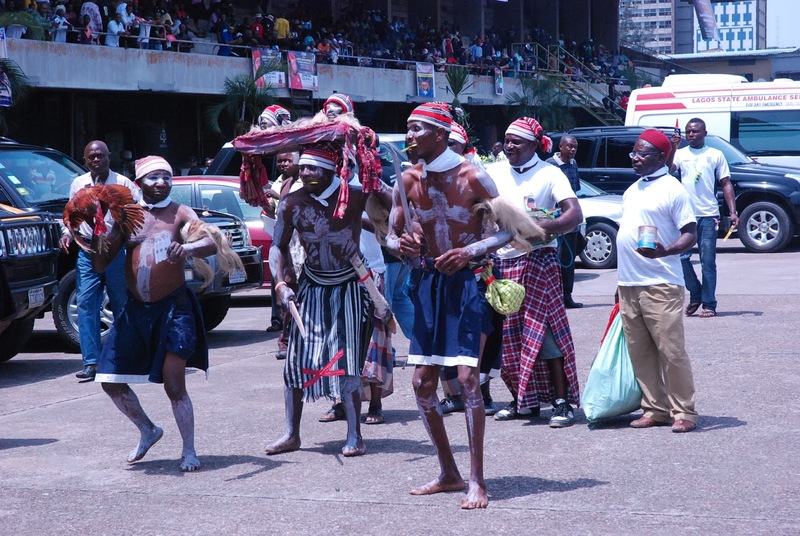 The dance which has its roots from Abia state is performed by a group of muscular men in commemoration of their strength in fighting and winning wars in the past. Ngwa umuagbogho is a maiden dance performed mainly by young maidens from eastern part of Nigeria. Although this maiden dance has many names depending on the community, Nkwa umuagbogho is more popular in Ebonyi state where the maiden dance got the name Ngwa umuagbogho dance group. Egedege dance is an Igbo traditional dance style that originated in the southeastern part of Nigeria. This dancestyle is as old as every other dance in Igbo land but made very popular by Queen Theresa Onuorah of Unubi in Anambra State. Aku na eche enyi, also known as Igba ndi Eze is mostly and Commonly used in a special events to usher in special guests, kings, titled men and women into special occasions. Igbo Masquerade Dance, The Igbo masquerade is a phenomenal dancer. One of the mysterious aspects of the masquerade is their ability to dance with so much energy for long periods of time. Egwu mmanwu as they are called in Igboland are performed by secret societies and represent ancestral spirits as well as deities. During the festivals, they provide entertainment as well as protection to those in attendance. Watching an Igbo masquerade dance is one of the most interesting and entertaining things anyone can see. Adamma is a contemporary maiden spirit mask that originates from Enugu state, southeastern Nigeria. The mask is performed by men only and is accompanied by music that the masker dances to. Unlike other Igbo masks Adamma mask does not have any spiritual value behind it. This dance is said to be strictly reserved for and performed by married women or much older women for some specific reasons. The dance generally involves responsive movement of the body in a rhythmic fashion to hip-swinging music and the women are attired in uniformed wear, which involves a blouse, mostly white in colour, double wrapper tied after each other, with one reaching or covering the entire leg, while the other hangs below the knee, in a ”three-quarter” way. There is always an ”Ichafu” (head tie, gear) to complement the dressing. Oge dance also called Ese in some part of igbo land is a very popular but yet not well know dance. Oge dance is mostly performed my elderly men to celebrate the life of a man who died at a very old age or a man presumed to have accomplished a lot throughout his life time. Instruments that gives Oge its melodious tone here includes xylophones (Ikpa) Ekwe slit-drums and Abia cylinder drum. I’ve always found traditional dancing interesting. Its so beautiful and so much better than modern dancing. I always look forward to watching traditional dance especially when we visit festivals. Aside from the amazing costumes, it also gives me an insight into their culture and beliefs. Thank you for sharing these popular dances in Igbo. They’re wonderful. I love to learn about different cultures! this looks so fun! These videos are incredible! I love learning about different traditions and cultures! Love this informative post! These are just beautiful. One of my very first jobs was with the Gallery in the Parks program in Chicago doing African dance. So much of Hip Hop and other popular music mimics the call and response traditions in African dance and music. Wow, these are really interesting! It’s amazing how much culture you can get from dance! Such beautiful dances! I love seeing the culture shine through, and their costumes are just breathtaking! I loved the pics and videos. I love to know more and more about different cultures and their dance forms. Great post..!! Dance is life. Here in Mozambique we also have tradicional dances. It’s fun to see all the colors and people dancing. Nice post. I am bookmarking this post. Wonderful dancing. It would make for a wonderful stage show here in North America. I just love their dance moves, so much energy and yet graceful and in sync, commendable dance forms. This is awesome. I love learning about all the different traditions of dance there is. It looks like a lot of fun to watch too. I love traditional dances. They are such a great way to explore the culture and are really fun . Thanks for sharing them with us. How fun! I love learning about different cultures! I would love to be there and see the dances performed live. They just look so incredible. I know I would love seeing it. My grandmother used to tell me stories of her going out there and what those dances were like. Oh wow this is so interesting! I have never heard of these traditional dances before but it looks like so much fun! I would love to see them in person! Dance is such a beautiful form of art! Thank you for including so many wonderful videos & pictures to really give us an idea regarding what the dance is really like. I love the energy dance, very cool! Wow, this is so cool! I have always wanted to learn and see traditional dance from around the world and since I can’t travel like I want to (lol), this is the next best thing. Thanks so much for sharing, these dances are absolutely wonderful! These are some fascinating and interesting traditional dance forms. It is very interesting how their dress jives with their dance moves, and how it also accentuates the dance. The costumes/dresses they use in the dance are really beautiful too. This is so cool to see. I love learning about different cultures and traditions.